Boys in our Books welcomes back one of our favorites, Therese Woodson, with an excerpt of her new book “An Ordinary Hero”. As a paramedic, Ryan Bishop has responded to his fair share of bizarre situations. However, he’s not prepared when he meets Phillip, a local man who keeps popping up to save the day. Everyone lauds Phillip as a hero, but he prefers to stay in the background, going so far as to refuse medical treatment. Ryan is intrigued, not only by Phillip’s unassuming manner, but also by his ability to be in the right place at the right time. Ryan wants some answers and maybe even a date. What he gets is an unexpected part in Phillip’s origin story. 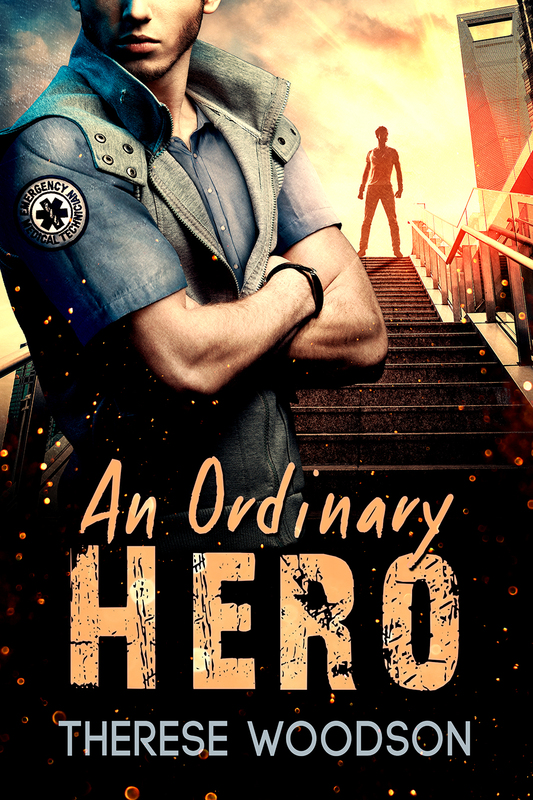 Hi and welcome to the AN ORDINARY HERO blog tour. Thank you to the lovely folks at Boys In Our Books who were kind enough to host me today. The idea behind An Ordinary Hero came from my love of comic books and superheroes. I wanted to explore the genre, but I wanted to do it with a twist. This story is an origin story, but told from the perspective of a frequent bystander. Ryan is a paramedic and encounters Phillip, the hero, at several different scenes. He knows something is not quite right with the way Phillip shows up then disappears but becomes infatuated anyway. Below is their first meeting. “I’m Ryan Bishop. I’m a paramedic with the Ambulance Authority. May I administer aid?” he asked, setting his bag at his feet. The hero looked up and oh. Okay then. Ryan’s heart double thumped because, well, this guy was gorgeous, and all thoughts of average flew out the window. It had to be the eyes, bright and blue and piercing. Or maybe it was the sharp cut of his jaw or the delicate slope of his nose or the sweep of dark eyelashes against his cheekbones. Ryan couldn’t say. He wasn’t a poet, by any means, but he wouldn’t be surprised if there were sonnets written about this guy. “I really don’t need any medical attention,” the hero answered. His voice was soft but succinct, with a lilt Ryan couldn’t place. Ryan smiled, trying for disarming but probably looking manic instead. He scanned the hero head to toe, gaze sweeping over his form. He had scrapes on his left elbow and a bruise forming on his jaw. He shifted slightly under Ryan’s scrutiny and wrapped an arm around his torso, as if he protected a tender spot on his left side. Ryan’s smile softened into something genuine, but then the hero continued. The hero sighed, shoulders rising and falling. He shot a quick look over to where the girl and the mother talked with Lopez. They didn’t notice him. Therese Woodson is a writer, a wife, a mother of three, a pet-owner, and a long-time member of her college’s sci-fi club. She is a fan of watching bad television shows, superhero movies, and anything involving mythology. She loves creating interesting characters, universes, and stories with happy endings. This entry was posted on December 9, 2015 by BioB in Blog Tour and tagged dreamspinner, excerpt, therese woodson.